From journalism to technology to entertainment, Assistant Professor of Communications – Public Relations Anastacia “Staci” Baird has developed expertise in a variety of communications fields. Born and raised in Topeka, Kansas, Baird started her college career as a journalism major, branched out to technology and entertainment, and did her graduate work in journalism and public relations. A social media innovator, she has worked in tech support and on “Star Wars” video games, most recently as engagement editor for an international online news outlet. 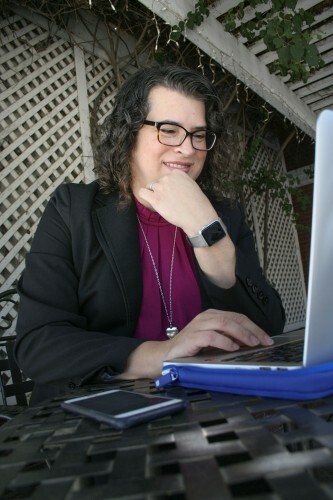 Now, as a professor at the University of La Verne, she is bringing her tech savvy to the communications classroom. In the evolving communications fields, she makes sure her teaching methods are on the cutting edge. Baird currently teaches News Reporting and Public Relations Methods at the University. Her students are introduced to using programs such as Slack and Google Drive as effective communication tools in the classroom. Baird, who earned her master’s degree in public relations from Kent State after studying journalism at the University of Kansas, recounted her journey and her experience so far at the University. At what point did you discover you wanted to go into communications? I’ve always loved people and storytelling, so that’s kind of the common theme throughout my life. I started out as a journalism major straight out of high school, but burned myself out being on the school newspaper. I was then told in advertising class if I wanted to be in advertising that I would have to play golf and learn to love golf, and I was like, ‘I’m out. I can’t. I hate golf so much.’ Then I just dropped out of school. When I dropped out as an undergrad, left college and the world of journalism, I ended up selling computers and I knew nothing about them. So I spent most of my days with techs and hung out with the geeks in the back who were fixing computers and taking apart computers. The journalist in me, I’m asking a thousand questions, so I got a total education on computers, how they were built, all the different parts. Then I ended up working in tech support for about six years, and during that time I started teaching myself HTML and realized, ‘Oh, this is a cool time for journalism, that there is this new creative outlet and new way to communicate with people so I decided to go to grad school, go back to journalism and actually go back to Kansas where I had started my undergrad. Is there a reason why you moved a lot during your career? I always knew I wanted to live somewhere other than Kansas. I think both of my parents, my mom especially, loved the idea of traveling around the world. She didn’t do a whole lot of it back then, so when I had the chance I moved to Seattle, that was my first big city. My boyfriend at the time was moving and I decided to go too, and I actually got a job offer before he did because I went to technology. Then my sister was murdered in 2001, so I moved back home to be closer to my mom and my dad, who were both in Kansas at the time. Family tragedy made me feel like I wanted to go back home, so that is why I ended up going to KU again and working on my journalism graduate degree. You think those things don’t happen to people, but it was pretty intense. Where have you worked before coming to La Verne? When I came to San Francisco, I took a job with Lucasfilm and the online division there, and I worked as the internet marketing manager. I also worked really closely with the creative teams and the public relations and market and sales teams with LucasArts, the video games division. It was probably the coolest job I’ve ever had since I’m a “Star Wars” fan. I never thought I wanted to work in the world of entertainment, but again it is all about storytelling. We got to tour the archives in Marin County, got to see props from the original movies and see models. I taught at San Francisco State University, was a lecturer there for two years and during that time I worked for CBS Interactive, did social media and community engagement for them. My career path has been not traditional by any means. Almost every job that I’ve had didn’t even exist maybe five years before I had it. Some of the roles that I had, they didn’t know what the job was until I took the job and made it into something. After I left SF State, I took a job as the associate director of digital and social media for the Stanford School of Engineering’s communications department for three years. Then I took some time off after my daughter was born, but continued to do work for Stanford in the HR department and communications as a contractor and I was a journalist-in-residence at Nortre Dame de Namur University. It was while I was at Stanford that I started working on my master’s through Kent State. How did you hear about this opportunity to teach at the University of La Verne? I heard about the job through the Journalism and Women Symposium. I loved my job at Global Press, it was such an amazing opportunity, but my family and I were really struggling in the Bay Area. It’s expensive and it’s getting crowded, and it just so happened that my husband saw an opportunity with Disney. It’s hard when you’re married and one of you find your dream job and the other doesn’t, but we both have our dream jobs. I’ve always wanted to be a full-time professor. It’s rare that it happens. You have taught at many other schools. Is there anything different about University of La Verne? I think from day one, I was pleasantly surprised with the community and how everyone has been welcoming and willing to help out. There is such a great support system here. We had a new faculty orientation and it was so organized and exciting. The three of us who are new to the College of Arts and Sciences kind of bonded on that day, so we’re buddies now, which is kind of fun. I feel like the students here are like students I haven’t had in a really long time. I also taught when I was in grad school at Kansas, I worked in the student newsroom and was a teacher assistant, and when I was in Knoxville I taught at the University of Tennessee. So I taught at a lot of different places, but the students here really want to learn and I really appreciate that because I’m the kind of instructor that sometimes when you have to individualize learning paths for people, I’m totally OK with that. Emily Lau can be reached at emily.lau@laverne.edu.